250ml. In Trays of 12. 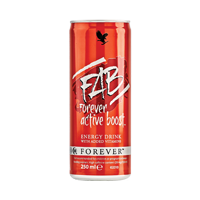 Forever Active Boost, tastes great and it contains a proprietary blend of herbs and nutrients. Most importantly it is high in vitamin B6 and B12, which contribute to the reduction of tiredness and fatigue. Other nutrients include niacin and pantothenic acid. Pantothenic acid is another essential vitamin to consume during exercise since it contributes to normal mental performance. Shake gently before use. Serve chilled. One to three cans per day. Carbonated Water, sugar,dextrose, acid (citric acid) stabilized Aloe Vera Gel, acidity regulators (sodium citrates, potassium citrates), taurine 600mg/250ml, Guarana seed extract, glucuronolactone, flavour, L-glutamine, herbs blend (Eleutherococcus S., Schisandra), inositol, vitamins (B3, B5, B6, B12) colour (carotenes). N.B. Contains caffeine. Not recommended for children or pregnant women.